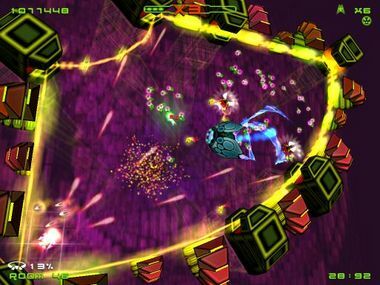 For shoot em up fans out there, this game is for you! Set over 89 arenas, all rendered in state of the art graphics, this really is old school gameplay bought right up to date. The stunning award winning action is rendered using the very latest 3D technology, unlike anything else you'll play. Latest features:- Support for our level editor! Play custom mission packs created by players from all over the world. Full mouse & keyboard support. Online highscore tables. Try and compete with our champions! Awards:- PCgamer Game of Distinction GameTunnel Game of the Year Nominated for the Edinburgh Games Festival Game of the Year.